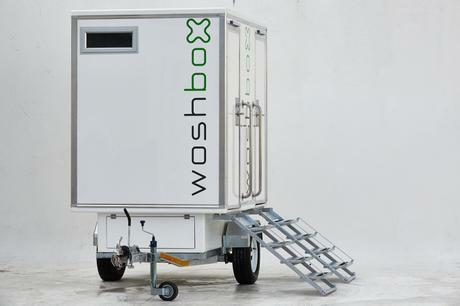 Developed after 20 years of research and development, Woshbox offer one of the most advanced toilet trailers in the world. The new Mark V contains the best features of the years of research. 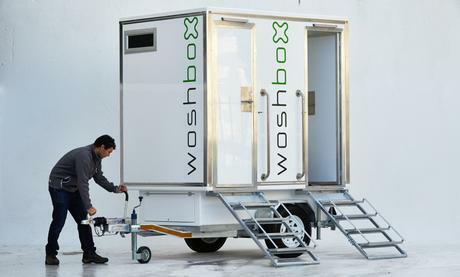 WOSHBOX have sold trailers to 19 countries around the world. The factory is based in Cape Town, South Africa and is geared up for export. This VIP unit provides luxury in a compact format. Exclusive and elegant, when space is limited, the unit will make every guest feel VIP. 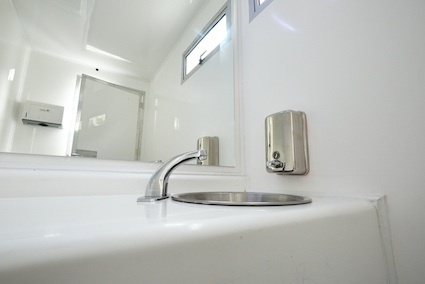 Mounted on a trailer, the unit houses both ladies and mens cubicles and vanity areas. 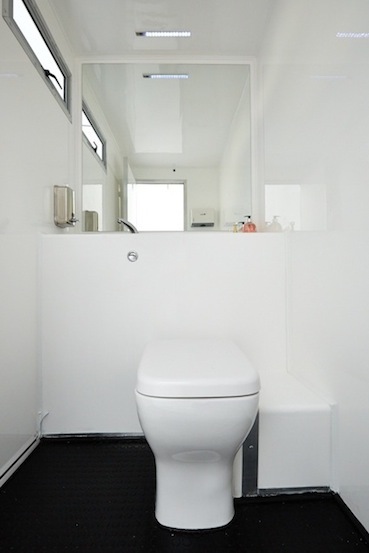 Each unit is designed to a unique specification, combining the highest quality fixtures and fittings, while still remaining eco and user-friendly. The unit is extremely light. At 900kg dry weight, it can easily and legally be towed by a 1 tonne truck or van. This equals massive savings on fuel costs over time. The trailer is well balanced on a single-axis so can easily be handled by just one person and maneuvered into tight spaces. - Entirely Modular from the easily removed and replaced corner caps to the high finish, wet laminated, mirror smooth composite GRP and PU foam panels. - All operational equipment in one easy to maintain area. The hatch houses the pumps, batteries, filters and cisterns which can easily be can be checked, cleaned or serviced. - Short electric and pumping lines are visible at a glance and take seconds to disconnect and reconnect if required. - Large Filter hatch inside a triple rebate – three gaskets, to protect against spillage, drains naturally back into the tank. - .5 m square of 50 stainless steel mesh in the filter - with “spray through fast clean” which rotate to vertical for easy cleaning through the hatch. This ensures minimal fuss and long service cycles. - All service functions located at rear of machine completely removed from the public and public accessibility. - Low pressure high speed cistern refills, in completely sealed cistern - rugged simplicity. Most cistern, pump and pipe connections are components designed for easy assembly and removal, finger tightened where possible. - 2 Pumps bridged together for functional redundancy and ultra quick cistern refills. The machine keeps working even on one pump. - Large solar panels and large capacity batteries ensure consistent smooth power delivery with no need to recharge. - Large seamless model cabins with integrated basin unit mean super smooth easy to clean, easy to repair cubicles - keeps the public happy. - Ultra light and ultra safe towing and handling dynamics. - All trailer components are certified to the EU/German TUV standard and are of the highest quality. 195/14 tyres on 14 inch, 6 stud epoxy coated rims. - The Woshbox system is designed for dual recycling operation or freshwater mains connection. Connecting to mains eater and sewerage is easily done. 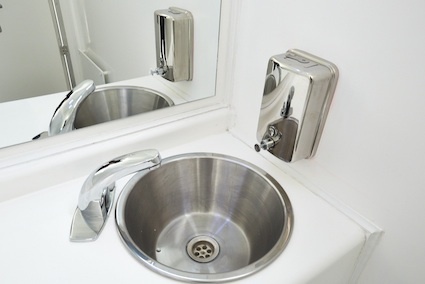 - A chemical injector has been incorporated into the design, injecting 5 ml of J&J Truex chemical (www.jjchem.com) into each cubicles pan each time either basin is used so the water in the toilet pan never loses its blue color or berry-like aroma. This method of dosing also prevents excess chemicals from entering the environment. You use ONLY what is necessary. Basin discharge water is also routed via the toilet pan. Freshwater and chemicals wash into the pan every time either automatic sensor basin is used. - The unit can perform approximately 900 flushes in between services (440 ml average Pax visit) 100L basin water.